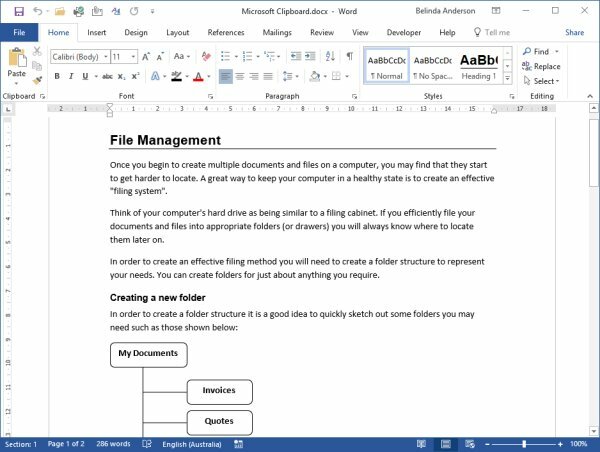 A common feature used within all of the Microsoft Office applications is the cut, copy and paste feature. I personally use this A LOT. The ability to cut, copy and paste within any of the applications and also between different applications provides a user with a high level of efficiency, and in turn, high productivity. An unknown bonus of this function is related to the use of the Office Clipboard. Often users will use the cut, copy and paste functions repeatedly. 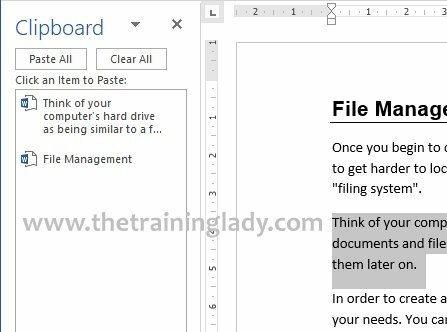 Most users know that the clipboard is the location where anything you cut or copy is stored until such time as you paste it elsewhere. What many people are unaware of is that the Office clipboard can store up to 24 different items you have either cut or copied and you can then paste these randomly into your files in any given order. Yep, that’s right! You are not limited to only pasting the last item that you copied or cut from your file. You can paste any combination of the last 24 items. Now the way you achieve this is by using the Office Clipboard. The clipboard generally stays hidden and does not display itself when we use the cut, copy and paste features. I’m sure, like me, that many users simply use the keyboard shortcut combinations to achieve these functions. Let me now show you how to utilise the full potential of the Office Clipboard. I am using a sample file I’ve created from some training notes which contains some headings, body text, an object, and an image. 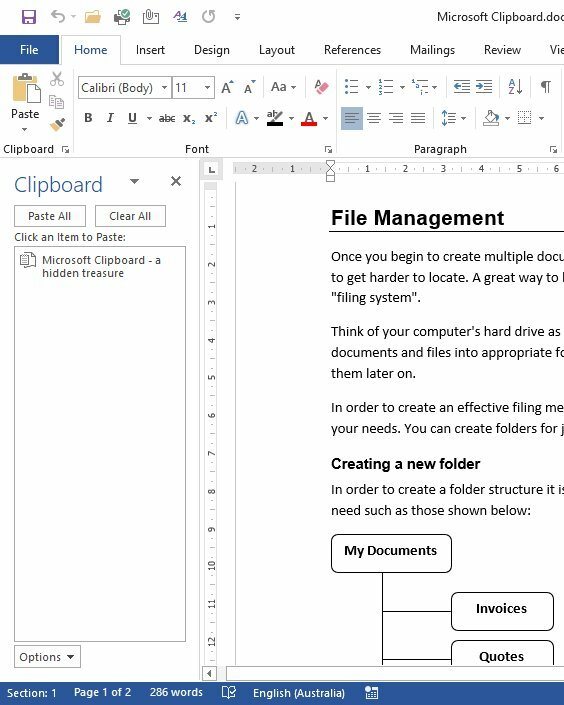 Show Office Clipboard Automatically The clipboard will automatically appear whenever you copy or cut content from your document. I initially enabled this setting, however, turned it back off as it means the Clipboard is displayed every time you use the cut, copy, paste feature. Show Office Clipboard When Ctrl + C Pressed Twice The clipboard will appear if you press Ctrl + C twice in succession. I personally have this setting enabled. 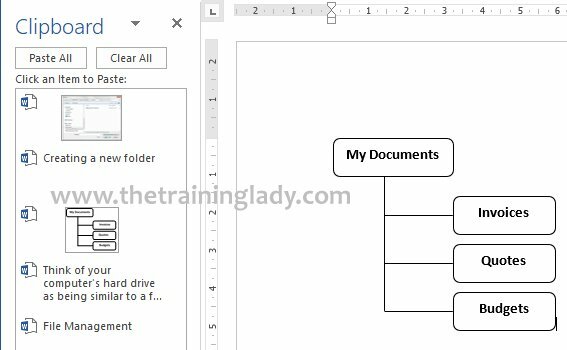 Collect Without Showing Office Clipboard Copies content from your document to the clipboard collection automatically. Sounds like a good idea but again I enabled this and turned it back off as it meant a lot of “You have a large amount of content in your Clipboard…” messages whenever I closed an application. 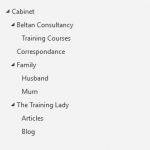 Show Office Clipboard Icon on Taskbar Will display the Clipboard icon on the taskbar which gives you easy access to view or clear the clipboard along with advising how many items have been added to the collection. 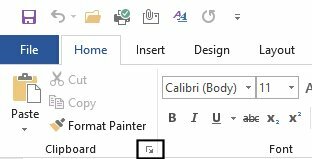 Show Status Near Taskbar When Copying This option will allow you to see a small popup window appear in the bottom right corner of your screen which shows you the status of the Office Clipboard. A regular question I see relating to the clipboard is the issue of people losing the content they had copied to the clipboard. 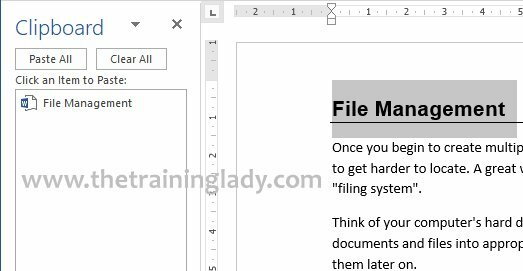 I have seen many users who have cut large amounts of data from one document or file and plan to paste the content into another file only to find that when they try to perform the Paste function, nothing is available. 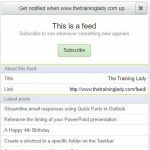 When you copy or cut content onto the Office Clipboard, that content is being stored temporarily. The clipboard will prompt you on what you want to do with that stored content if you do not clear the content yourself. If you are only copying or cutting small amounts of data, then that data will remain in the Office Clipboard for you to use elsewhere. If however you have cut or copied a large amount of data, which is taking up significant storage space, then the Clipboard will ask you what you want to do with it. This prompt is essentially advising that there is content in the Clipboard, do you want this available to use in other applications after you quit Word? 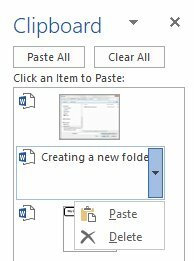 If you plan to paste the content that you have stored in the clipboard, into another file or program, you MUST click Yes. 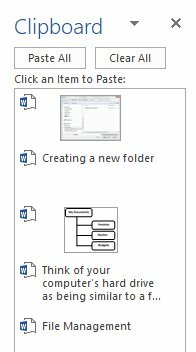 If you click No, anything being stored in the Office Clipboard will be deleted. Clicking Cancel will simply keep Microsoft Word open allowing you to continue to interact with the Clipboard. I hope this post on the Office Clipboard helps save you some time in your day. 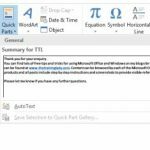 Please feel free to contact me if you have any questions which I have not answered here or if you are having an issue with a different feature of any of the Microsoft Office applications. 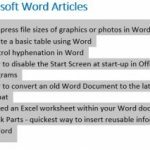 If you would like to use Microsoft Word more efficiently, why not check out My Favourite Shortcut Keys for Microsoft Word.